What Is The Best Bassinet For Small Spaces? Preparing for the arrival of a bundle of joy shouldn't be difficult, but with so many options for how and where your baby will be sleeping, you may be overwhelmed. On one hand, having the baby far away in his or her crib can feel isolating for both parent and baby. On the other hand, co-sleeping can be extremely nurturing but put the baby in a vulnerable position. A bassinet for small spaces may turn out to be the sleeping solution that you need. What is considered a small bassinet? Standard crib size is 30"x 54" or a 1620 square inch footprint. A smaller Pack and Play is 39" x 25" or a 1140 square inch footprint. Bassinets come in various shapes and sizes, but overall, a smaller bassinet will fall under a 1000 square inch footprint. All of the bassinets reviewed fall into this category. Do I need a bassinet for my baby? Only you can answer this question for yourself, but you may want to consider a bassinet if you would like your baby in the room with you at night (AKA room-sharing). This could be for your own peace of mind as well as for having baby close for feedings. Mothers who have had c-sections or difficult deliveries tend to prefer a bassinet nearby so that they can easily reach the baby without having to get out of bed. Also, if you like the idea of being able to take the baby from room to room in your house, a portable bassinet (with or without wheels) may be the ideal piece of baby gear for you. What are the advantages of a bassinet over a crib, playard/portable crib, bedside sleeper or cradle? While a crib is typically in a baby's own room, a bassinet is a safe place for baby to sleep close to parents without being in the bed with them. A bassinet is usually much smaller than either a crib or playard and can be moved from place to place throughout the home. Easy access means ease of care for baby (rocking, feeding, burping, etc.) and for a mom most likely in recovery from giving birth. On the other hand, a crib is stationary and somewhat isolated. 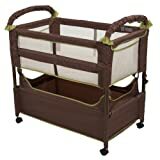 A playard/portable crib is ideal for staying set up in other parts of the house but is a hassle to put up and take down multiple times a day. It is also much larger than a bassinet. A cradle is a more old-fashioned sleeping arrangement for baby and typically has not gone through rigorous safety testing. Another option is a bedside sleeper which attaches to the parents' bed; however, it does not move either through rocking or throughout the house. What is the best way to use a bassinet? Child safety experts and manufacturers have strong recommendations regarding s﻿leep﻿ safety which also applies to bassinets. Age limits are usually from birth to four months and weight limits up to 15-20 pounds. Consumers should take care that the mattress is firm and of 1 1/2 inch maximum thickness. Tight-fitting sheets and locking wheels are also necessary safety elements. Bassinet users would also be wise to exercise caution regarding the other people and animals in the house such as older siblings, cats and dogs who may try to climb into the bassinet, move it or rock it in a way that could pose a hazard to the baby. What are the prerequisites to using a bassinet? The U. S. Consumer Product Safety Commission (CPSC) had no official regulation until 2014, so purchasing a used bassinet means that it may not meet all current safety requirements. The baby should be under four months old, under 20 pounds and not rolling over. A baby that can roll over (but is still under the recommended age and weight limits) can inadvertently use his/her body weight to upset the balance of the bassinet. This is more typically found in a bassinet that rocks or swings. 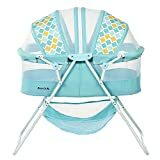 What are some controversies over bassinets? Safety is really the biggest concern with any baby's sleeping arrangements, including bassinets. Loose-fitting sheets, layers of blankets for cushioning, thick mattresses, plush toys, pillows and anything that could suffocate the baby shouldn't be in the baby's sleeping area. Baby should be sleeping on a thin, firm mattress, tight-fitting sheet and in a well-ventilated area free of extras, including crib bumpers, thick blankets, pillows and toys to reduce risk of SIDS (Sudden Infant Death Syndrome). This popular bassinet has several key features that make it work for newborns and their parents. It's portable, lightweight (only 7.5 pounds), takes up a small amount of space (31"L x 27"H x 23"W) and folds almost completely flat. Even though it doesn't have wheels, it folds up easily to move from room to room or to take with you when leaving the house. Its legs are curved so that you can gently rock your baby although we have found that it works much better on wood flooring than carpet. Mesh sides greatly reduce the risk of suffocation, and the mattress is thin and firm, all features that rate highly in the safety category. Additionally, there are no sheets for this product, so no concerns about suffocation. The bassinet comes with a mattress pad that fits safety regulations and is machine washable and dryer safe. There is a detachable toy component, but the small, attached mirror sticks out somewhat and is permanently attached. If it disturbs or distracts your baby, you may consider removing it with scissors. This bassinet does sit lower than a typical adult bed, so you would need to reach down to get your baby, which may be more difficult initially. Also, there is no storage area for baby essentials, due to the minimal nature and foldability of this product. Overall, this product rates highly for safety up to 20 pounds, and its green, white and orange design makes it gender-neutral. Small size: 31"L x 27"H x 23"W (837" footprint). Safety rated for up to 25 pounds and 5 months old, this bassinet has a lot of features that make it desirable. I like that it's lightweight, portable (can even be taken outside), easy to assemble (only 3 pieces!) and has an adjustable canopy to block light. The foldable, zippered canopy is a great feature if you have curious siblings, cats or other pets around your house. Also, if you want to be outside with your baby, this protects him or her from bugs. The bassinet comes with a one inch thick mattress pad which is pretty thin and hard. You may want to consider purchasing an additional bassinet mattress and cradle sheet if you plan to use this on a daily basis. This product is safety-compliant with polyester foam, breathable mesh sides, locking casters and storage space for baby items. Measuring 35.5" x 18.3" x 47", it's high enough to be easily reached from an adult bed without having to bend over too much. Aesthetically, you have a choice of design because it comes in seven different bright colors. This simply designed white cradle/bassinet projects a modern feel as well as provides a secure place for your baby to sleep. Its low height, portability, gentle rocking motion and transparent mesh fabric are perfect for supervising your baby from anywhere in your home. This cradle is safety rated for 6 months and 18 pounds or when baby can sit up, kneel or stand without help. There is no baby storage area, but a mesh canopy to provide ambient light and a fitted, manufacturer tested cradle sheet are sold separately. The manufacturer recommends this particular sheet only because it has been safety tested for use with this particular model. The fabrics are Oeko-Tex Standard 100, class 1 approved, an international safety standard for textiles. All materials are washable and the mesh sides provide proper ventilation for baby. As with most baby products, warning labels are sewn to the product and are not removed easily. They can be unsightly but do not hinder the product's use in any way. Be aware that a small amount of formaldehyde was used in the production of the supporting MDF at the bottom of the cradle. This bassinet has a lot going for it: small footprint (34" x 20" x 31"), height adjustments on the legs, all-side mesh visibility and portability with wheeled legs. I would have loved having the leg extensions as you never know where exactly you will want the bassinet positioned to be able to comfortably reach baby in the night. On the highest possible setting, it may be a bit wobbly, so I would probably lower it down from that setting. Also, being able to fall asleep next to the baby with the "clear-vue" feature would be wonderful for bonding without having the risk of actually bed-sharing with baby. Unfortunately, this product doesn't fold up like many others but does wheel around the house easily. For use up to 5 months, this bassinet comes with a mattress fitted sheet strap and plate, but you will probably want to purchase a sheet or two and mattress protector. There is a nice-sized storage basket for baby essentials. As far as safety, the thin mattress, mesh sides and lack of toys, mirrors, etc. makes for a safe, ventilated sleeping area for baby. Other color options are available for this model if you don't prefer the brown/green combination. Marketed as both a portable bassinet and as a travel crib, this is a product that is good for traveling or staying at home. I appreciate the ability to set up in mere seconds due to snap-on legs, and anti-slip feet keep the bassinet securely on all four legs. Keeping this bassinet sparkling clean would be a breeze because every piece of fabric is washable and because accidents are bound to happen. It doesn't come with a waterproof sheet, so purchasing one would be helpful. Although the bassinet is not entirely mesh, see-through windows allow easy view of baby from both sides and some breathability. 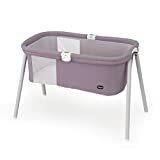 The total space taken up is 36" x 27" x 22" (larger than a typical bassinet), and the manufacturer recommends this product for use up to 20 pounds. Three colors of chestnut, lavender and sky give some options for complementing your decor. This product doesn't have wheels that can help with moving this bulkier bassinet from room to room in your house, but it isn't very heavy. It also folds away if needed for storage or for traveling, and comes with a handy carrying case. Finding good-fitting sheets can be a difficulty (the ones from Chicco are pricey) and there is no underneath storage, but it does have a nice, streamlined look. There is also a deluxe version that has a canopy. 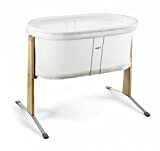 If I were choosing a bassinet, I would definitely purchase the Arm's Reach Concepts Clear-Vue bassinet. It's not the most beautiful choice but seems to be the best functioning option. Most importantly, it's a clear winner in the safety department because of its breathable, mesh sides, thin but well-supported mattress and lack of extras. Only one bassinet that we reviewed was a smaller size. (This product has a 680" square inch footprint.) The ability to be raised and lowered is also a key functional element for being able to stay in bed while reaching baby comfortably. Portability, storage area and usage up to five months make this a bassinet that you should be able to get good use out of while your baby grows.